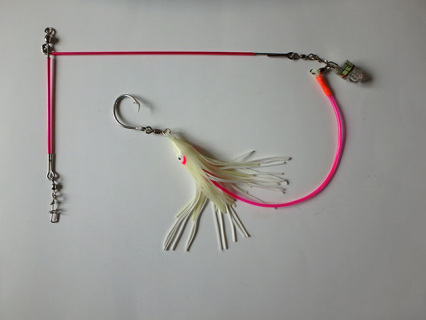 Outfish your friends when you fish with Brite Bite Mono Spreader Leaders. Made with 500 pound test monofilament fishing line and glow or UV tubing. 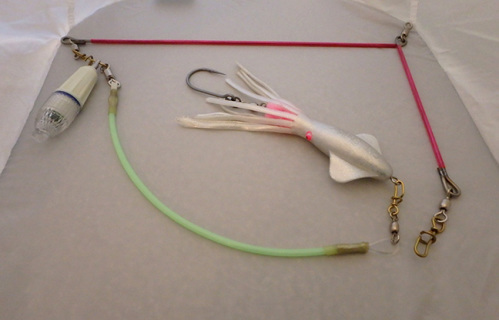 Brite Bite products were invented and tested by Alaskan fishing guide John Beath to catch more halibut. Secure check-out. We accept Visa, Mastercard, and Discover as well as PayPal. When checking out online you may have to go through several screens before you get to the option to use your card. If you are outside the USA or have difficulties checking out you can find these products at SquidLures.com. 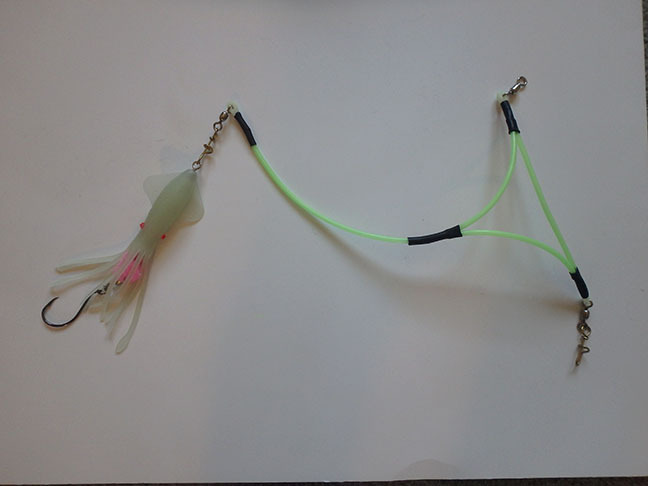 Mono Spreader with 500 pound test line and UV tubing. Spreader is about 15x9 inches. It has swivel for line attachment and corkscrew swivel for lead. 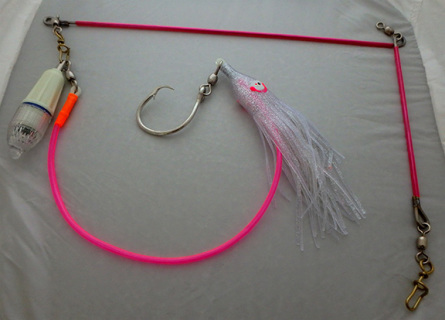 Just add bait on the 16/0 circle hook and it's ready to catch fish. 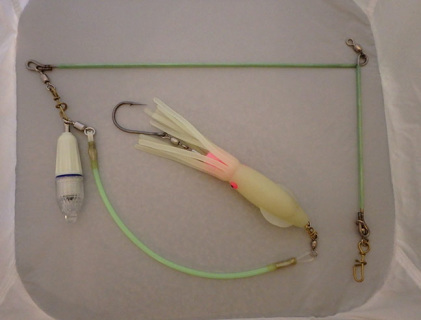 Mono Spreader with 500 pound test line, glow tubing, 16/0 circle hook and swivels. 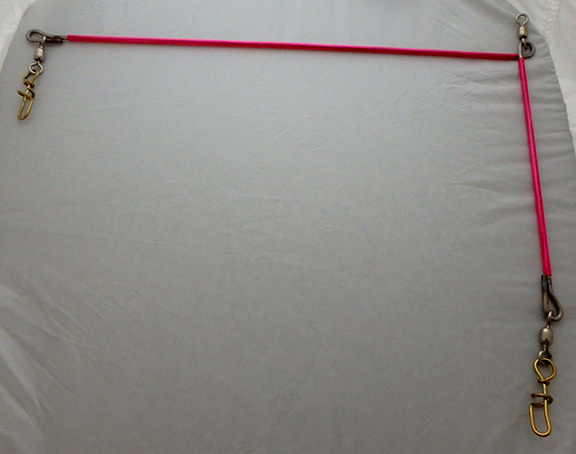 Spreader is about 15 inches long and 9 inches wide. Glow mono spreader light rigs consistently outfish everything else used on the same boat. 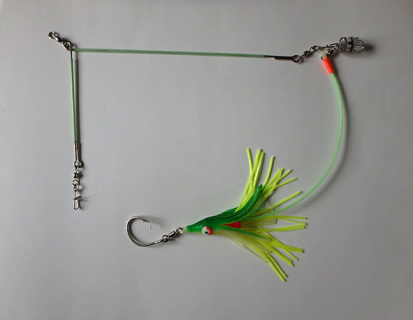 Fish can't resist this glow spreader with flashing light. Handmade in the USA. This UV mono spreader has a corkscrew swivel in place of a hook. 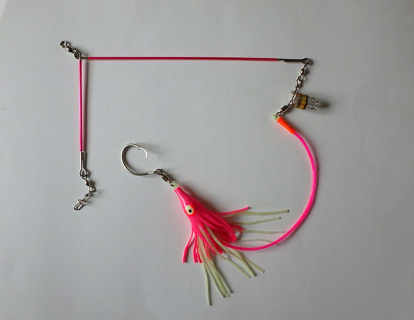 It comes with a 7.5 inch UV fat squid. The corkscrew swivel makes it easy to change to a different size or color of squid whenever you want. Like all the monospreaders, it has a swivel to attach to your line and a corkscrew swivel for adding weight. Monospreader made in the USA. 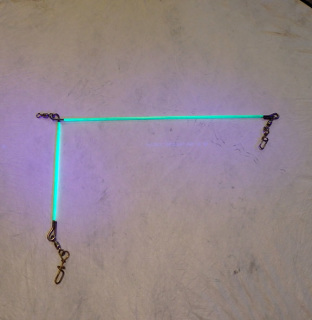 This glow mono spreader has a corkscrew swivel in place of a hook. 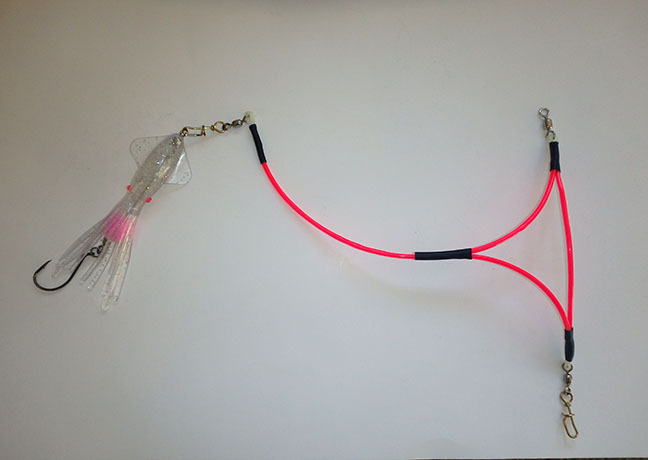 It comes with a 7.5 inch glow fat squid. 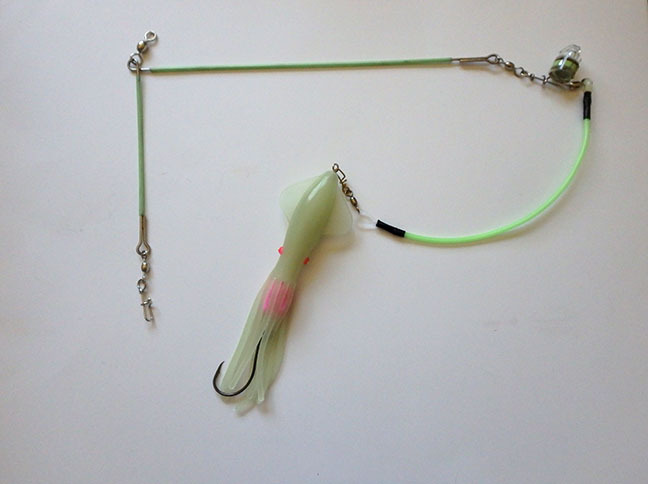 The corkscrew swivel makes it easy to change to a different size or color of squid whenever you want. Like all the monospreaders, it has a swivel to attach to your line and a corkscrew swivel for adding weight. Monospreader made in the USA. 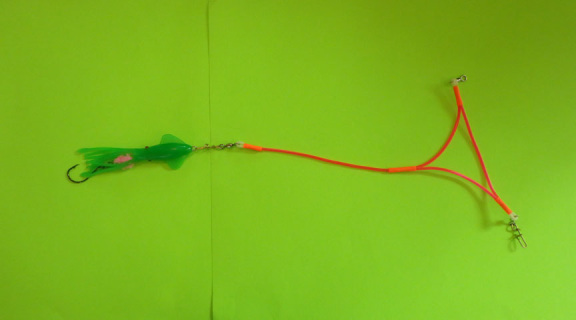 This made in the USAUV mono spreader has a corkscrew swivel in place of a hook. 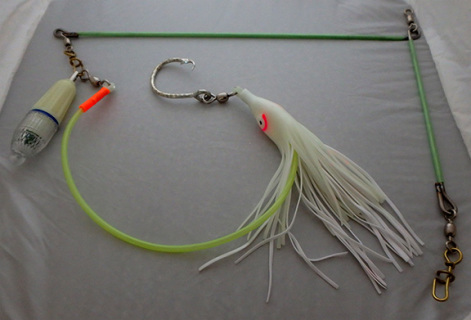 It comes with a 7.5 inch mean greenUV fat squid. 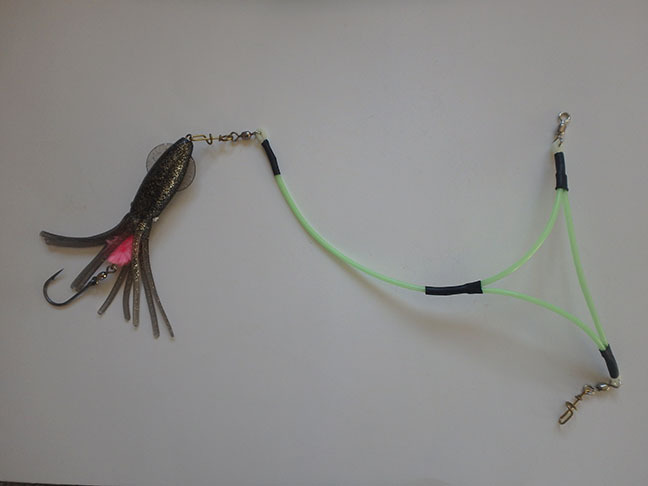 The corkscrew swivel makes it easy to change to a different size or color of squid whenever you want. Like all the monospreaders, it has a swivel to attach to your line and a corkscrew swivel for adding weight. 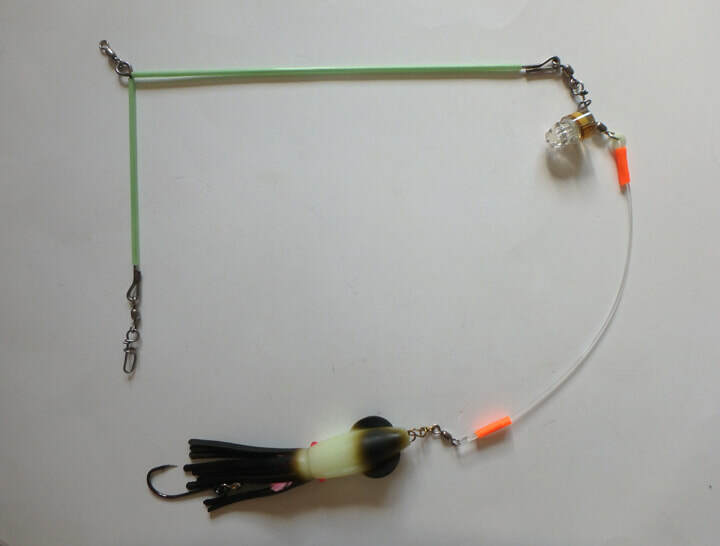 This glow mono spreader has a corkscrew swivel in place of a hook. It comes with a 7.5 inch mean green UV fat squid. The corkscrew swivel makes it easy to change to a different size or color of squid whenever you want. Like all the monospreaders, it has a swivel to attach to your line and a corkscrew swivel for adding weight. Monospreader made in the USA. 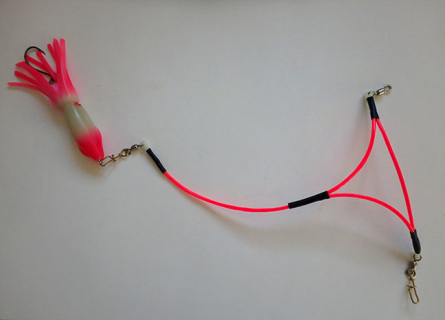 This UV mono spreader has a corkscrew swivel in place of a hook. It comes with a 9 inch glow pink Z2 squid The corkscrew swivel makes it easy to change to a different size or color of squid whenever you want. Like all the monospreaders, it has a swivel to attach to your line and a corkscrew swivel for adding weight. Monospreader made in the USA. 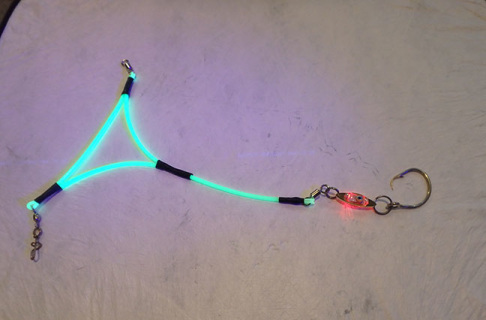 This glow mono spreader has a corkscrew swivel in place of a hook. 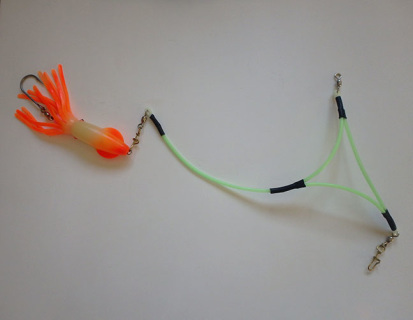 It comes with a 9 inch orange glow Z2 squid. 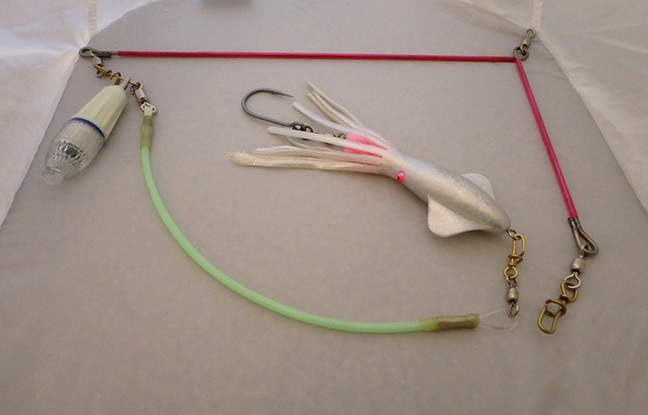 The corkscrew swivel makes it easy to change to a different size or color of squid whenever you want. Like all the monospreaders, it has a swivel to attach to your line and a corkscrew swivel for adding weight. Monospreader made in the USA. 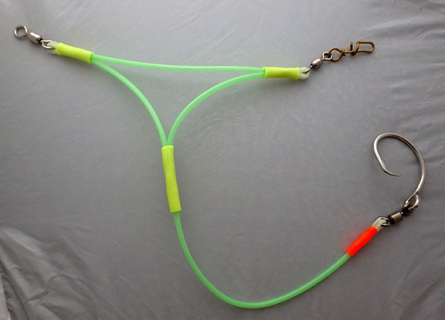 This glow mono spreader has a corkscrew swivel in place of a hook. 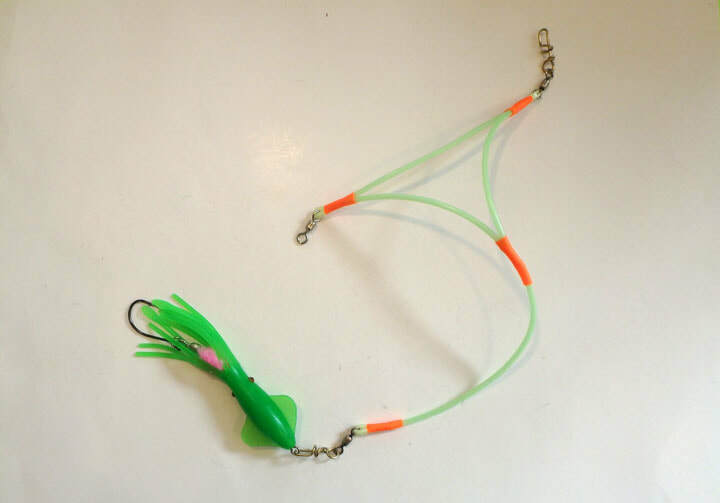 It comes with a 9 inch oil slick color Z2 squid. The corkscrew swivel makes it easy to change to a different size or color of squid whenever you want. Like all the monospreaders, it has a swivel to attach to your line and a corkscrew swivel for adding weight. Monospreader made in the USA. Fish see UV deeper into the water column than any other color. Brite Bite UV products light up in UV light to attract fish in the dark of deep water. Bars are 15 inches and 8 inches long. Spreader has swivel for line and corkscrew swivels for quick and easy attachment and changes of led and lures. Glow spreader bar shines brightly in the dark depths of the water beyond the reach of light to bring fish to your lure. Bars are 15 inches and 8 inches long. Spreader has swivel for line and corkscrew swivels for quick and easy attachment and changes of led and lures. 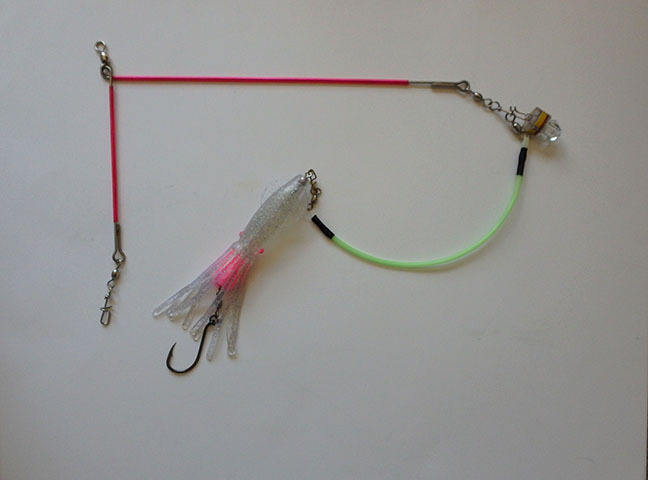 Spreader bar rigged with lure and underwater light. 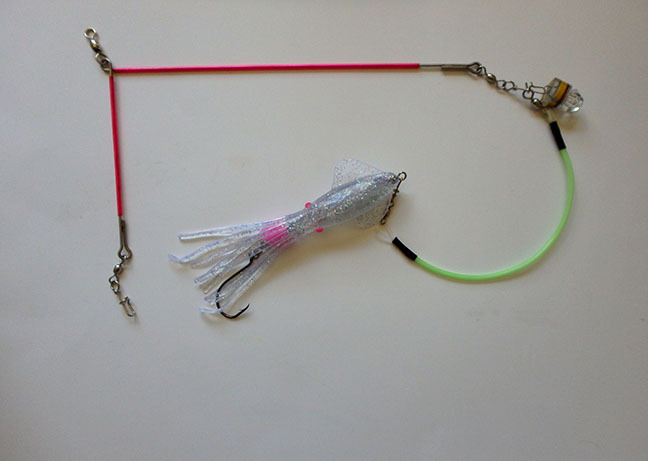 Just add weight and bait and it's ready to catch fish. 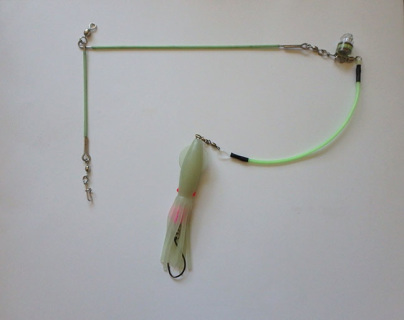 Corkscrew swivels make changing lights, lures, and weights quick and easy. 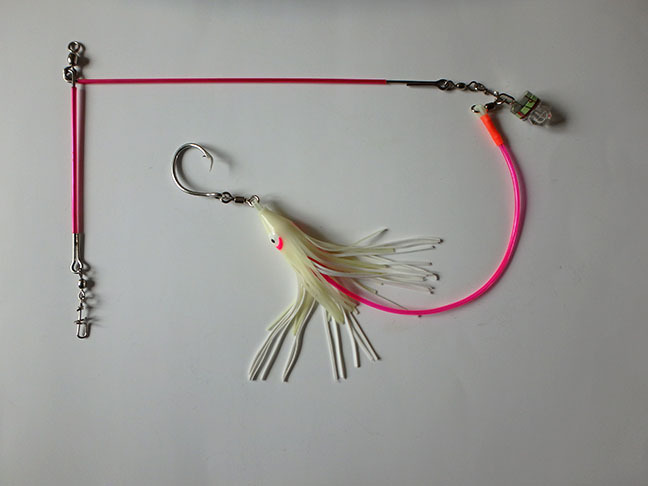 Extra lights are available on the tackle page in four colors and two styles. 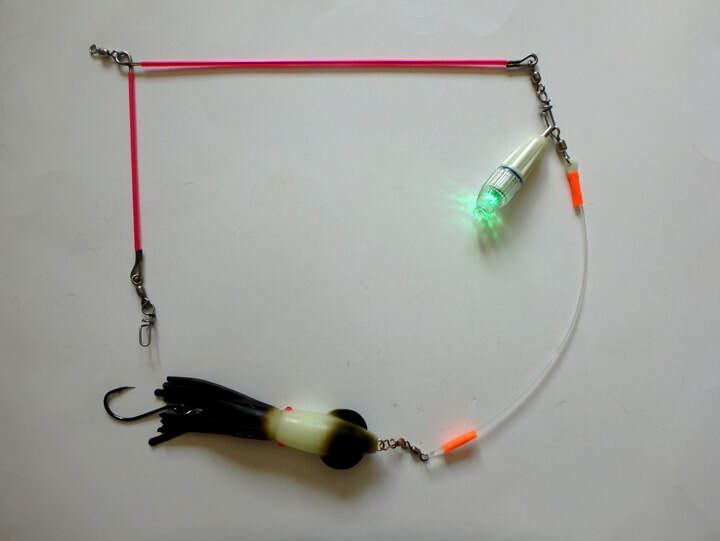 UV spreader bar rigged with UV white 10 inch fat squid on glow squid leader and UV trophy torch underwater fishing light. Light uses one AA battery, not included. Blue light charges up glow tackle and brightlylights up UV tackle in the dark. Fully rigged spreader bar with 10-inch UV fat squid, UV water activated light, and glow squid leader. Corkscrew swivels make tackle changes easy. 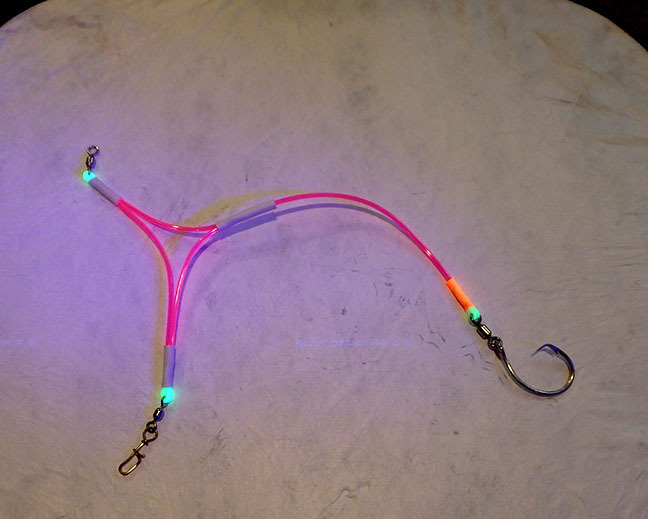 Glow spreader bar rigged with glow Z2 squid on glow squid leader and UV trophy torch underwater fishing light. Light uses one AA battery, not included. Glow spreader bar rigged with root beer glow Z2 squid on glow squid leader and green trophy torch underwater fishing light. Light uses one AA battery, not included. 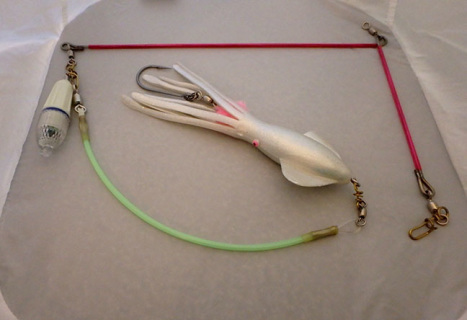 UV spreader bar rigged with white 7.5 inch fat squid on glow squid leader and UV trophy torch underwater fishing light. Light uses one AA battery, not included. 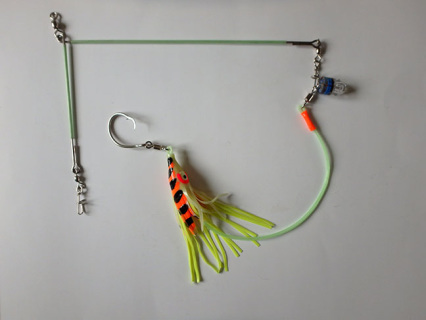 Blue light charges up glow tackle and brightly lights up UV tackle in the dark. 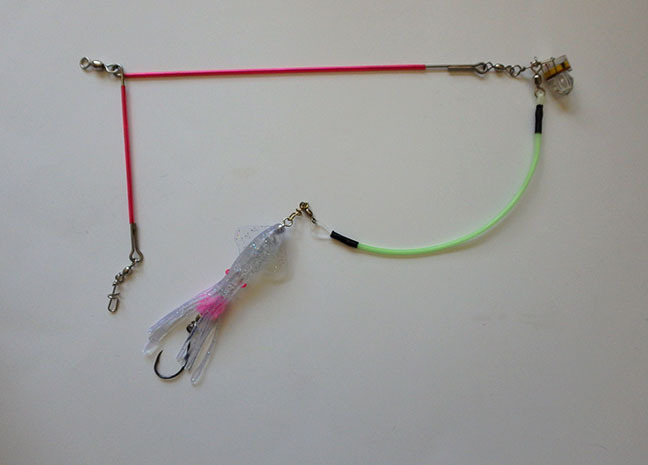 UV spreader bar fully rigged with upside down UV double skirt octosquid leader and AA battery operated UV light. Battery not included. 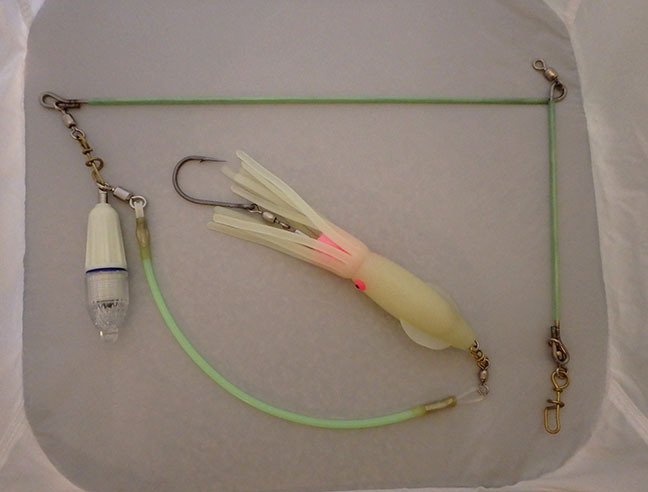 Blue light brightly lights up UV tackle in the dark. Glow spreader bar fully rigged with upside down glow double skirt octosquid leader and AA battery operated UV light. Battery not included.